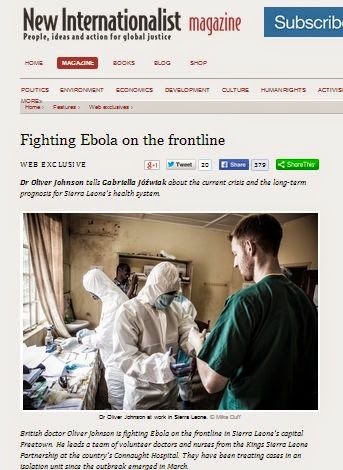 "British doctor Oliver Johnson is fighting Ebola on the frontline in Sierra Leone’s capital Freetown. He leads a team of volunteer doctors and nurses from the Kings Sierra Leone Partnership at the country’s Connaught Hospital. They have been treating cases in an isolation unit since the outbreak emerged in March. In this interview, Oliver Johnson talks about the situation in Sierra Leone, and warns that without urgent international assistance Ebola threatens to undo all the reparations the country has achieved since the end of its decade-long civil war in 2002..."
Read the full interview on the New Internationalist website. King's College has launched an emergency Ebola appeal.